Climate change is affecting so many of the things we love: our health, our communities, our sisters and brothers overseas. Imagine how amazing it would be if we could tackle it. This Valentine’s Day, you can be part of that achievement. 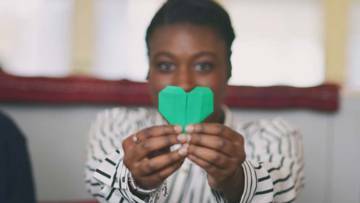 Download your green hearts toolkit to get involved. In his encyclical Laudato Si’, Pope Francis invites us all to have a conversation about how we are shaping the future of our planet. We all love something that is affected by climate change, from our global neighbours living in poverty to treasured places here in the UK. It is something worth talking about. 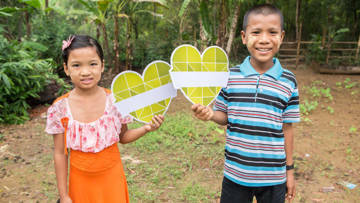 CAFOD joins the Climate Coalition's Show the Love campaign every Valentine's Day to start conversations about how the things we love are affected by climate change. Show your love for our common home by starting a conversation about climate change and how it affects our global neighbours. This page is full of resources, prayers and creative ideas to help you get talking about climate change with your parish, friends, family and even your MP. Use this community guide and intercessions to start a conversation in your parish and order green hearts from the Climate Coalition. Show the Love this year is themed on food! Start a conversation on climate change using these yummy recipes. 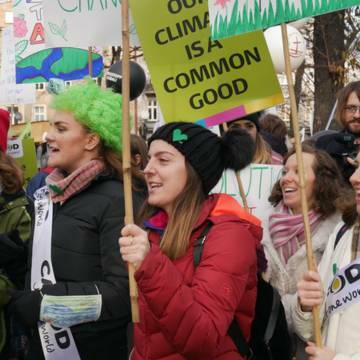 Talking to young people about climate change? Use these resources for primary or secondary schools. Need help talking about climate change? Use these resources to tell others why we need to care for our common home.